The Moody 44 was introduced in August 1991, and ceased production September 1996. The production run was of 114 boats, and my boat was one of the last to be built by Marine Projects (Plymouth) Limited. The designer was Bill Dixon. Enterprise was one of the last Moody 44’s built. 3. Capsize Screening Formula (CSF) The technical committee of the Cruising Club of America came up with a simple formula to determine if a boat had blue water capability. The CSF compares beam with displacement since excess beam contributes to capsize and heavy displacement reduces capsize vulnerability. The formula is the maximum beam divided by the cube root of the displacement in cubic feet; B/Displ.333. The displacement in cubic feet can be found by dividing the displacement in pounds by 64, of course. The boat is acceptable if the result of the calculation is 2.0 or less but, of course, the lower the better. For example, a 12 meter yacht of 60,000 lbs displacement and 12 foot beam will have a CSF Number of 1.23, so would be considered very safe from capsize. 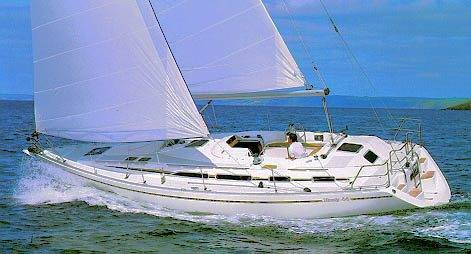 A contemporary light displacement yacht, such as a Beneteau 311 (7716 lbs, 10’7″ beam) has a CSF number of 2.14. Based on the formula, while a fine coastal cruiser, such a yacht may not be the best choice for ocean passages. What’s puzzling is that a yacht like the Tartan 4100 (CSF 2.02) and the Sabre 402 (CSF 2.01), both of which have pretty well documented track records as a blue water cruisers should have a CSF of over 2.0 – indicating that they fail the test described here…they are quite beamy for their weight…I guess.